Mr. Wayman grew up in Cortez, CO. He attended Mesa Elementary, Cortez Middle School and Montezuma-Cortez High School. He played Football, Basketball, and Track and Field. After graduating from M-CHS in 1998, he attened Western State Colorado University (formerly know as Western State College). He graduated with a Bachelors Degree in Math and Teacher Education in 2003. Jason returned to Cortez and took a position teaching Math at Cortez Middle School. He worked during this time to receive his Master's Degree in Educational Leadership from Grand Canyon University. He moved into an administative role at Mesa Elementary as the Assisant Principal and eventually became the Mesa Principal. 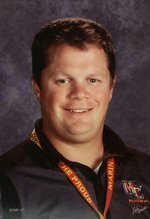 In 2012, Mr. Wayman stepped into his current role as Principal at Montezuma-Cortez High School.